I found these at Bed Bath And Beyond and simply love them. They have a clear lid, and most spices can be dispensed without opening the lid. They have magnetic bottoms, and can also be used on a magnetic board hung on the wall. They fit in my spice drawer nicely. 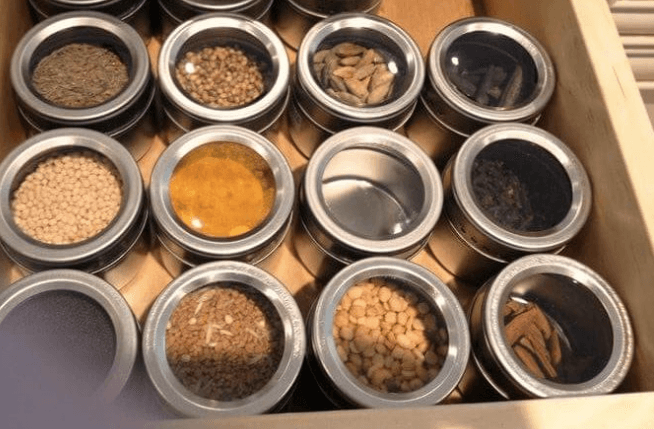 I find these more convenient and efficient to use as I can tell when a spice is running low, I can dispense without opening the lid, and my spice drawer fits almost all my spices whereas the traditional Indian spice dabba can hold at the most just 6 or 7 spices. I picked this up in Hyderabad, India but is widely available anywhere. 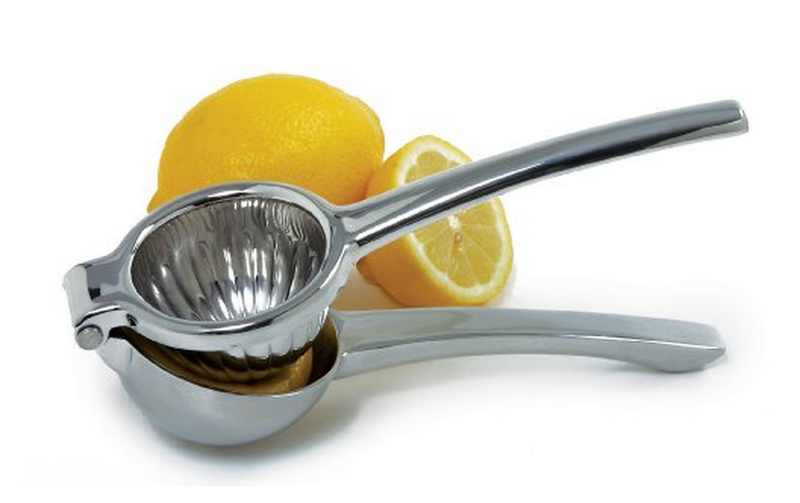 I love this for getting fresh lime/lemon juice to the last drop without getting my hands dirty! I cannot cook without this. I use a lot of raw tamarind that I soak and extract juice out of for many of my South Indian dishes. I use this to strain the extract. You can find this in most Indian grocery stores. A staple in most Indian households. 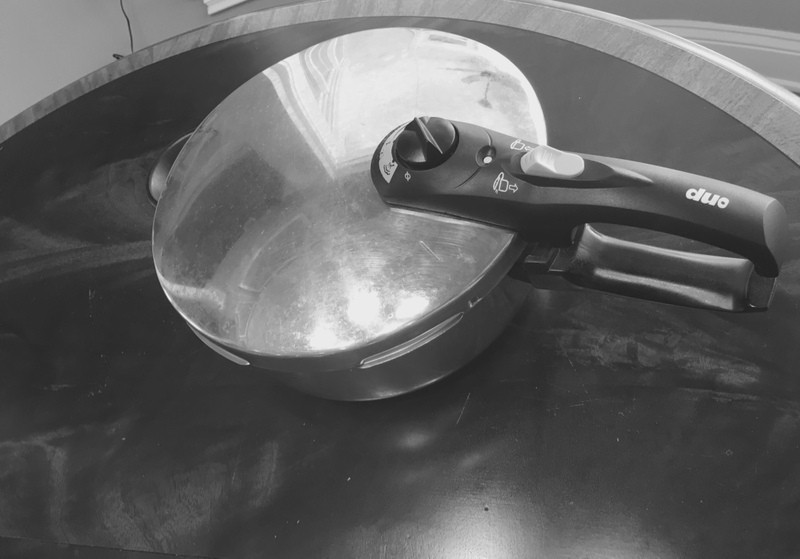 Cooks almost anything efficiently and perfectly. I use it to cook all my lentils, and rice. Cannot live without this. The Indian models work by releasing pressure with a “whistle” that you count to determine how long to cook. I use the American one, (Duo by Fagor) and it is noiseless, and timed cooking. Have had this for at least 10 years, and it’s going strong. Might have to replace the washer once in a while. Great investment! You can find these in all sizes at many places like Costco, Williams Sonoma, and the like. I use it to crush spices coarsely. 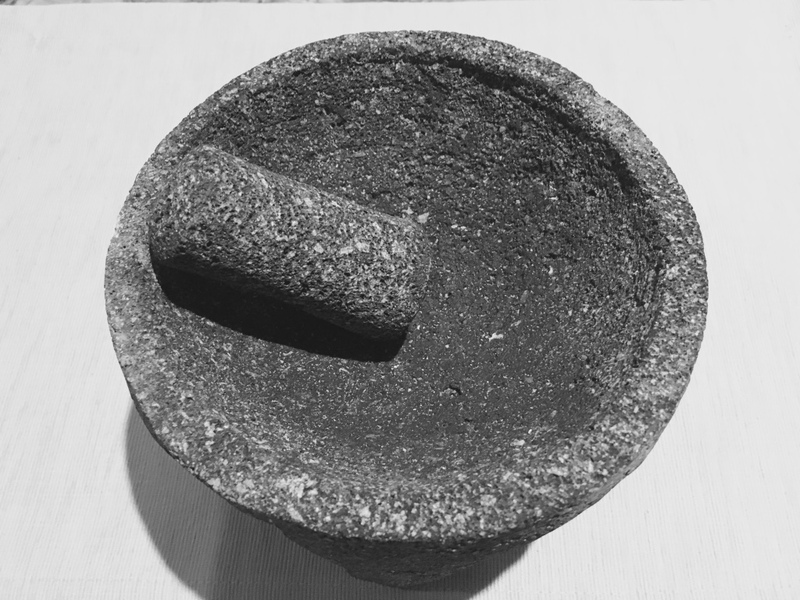 The flavors are somehow fresher when pounded/crushed in a stone mortar and pestle. I have two of these, actually – one in marble, slightly smaller, that I use only to crush ginger and cardamom for my afternoon tea. I use this one for all other spices. 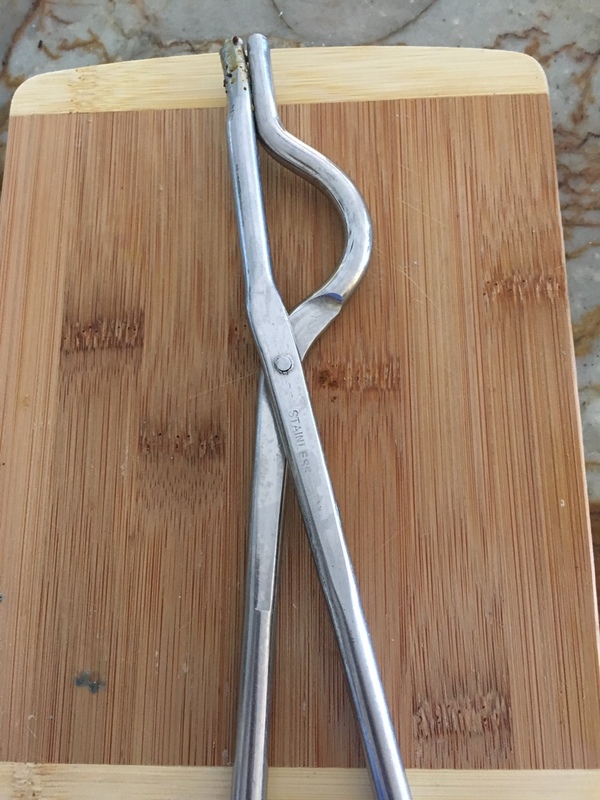 Another staple in my kitchen, I have this in multiple sizes and use it for many purposes – to saute vegetables to perfect crispiness without burning, frying/roasting spices, warming food, etc. It is made of Aluminum. 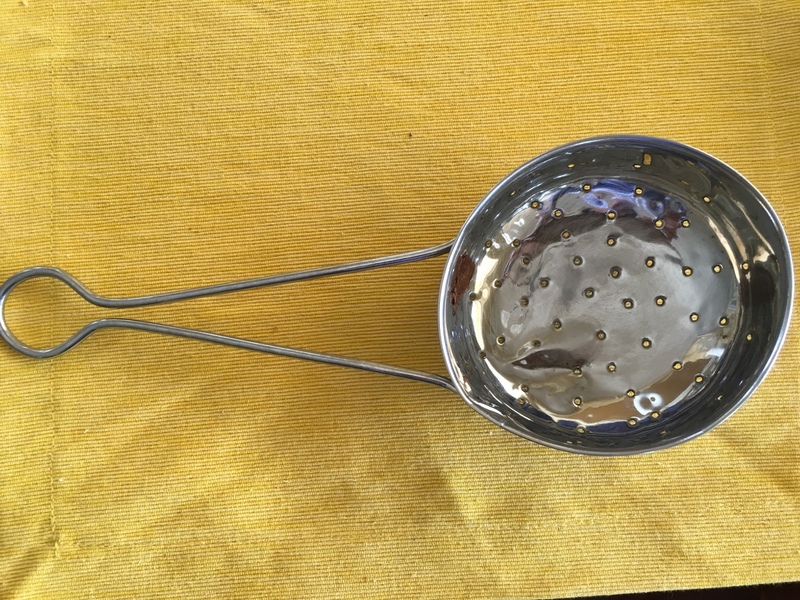 i have it in different thicknesses – the thickest ones used to in recipes that call for heavy-bottomed pans, and the thinner ones mostly for quick roasting of spices. 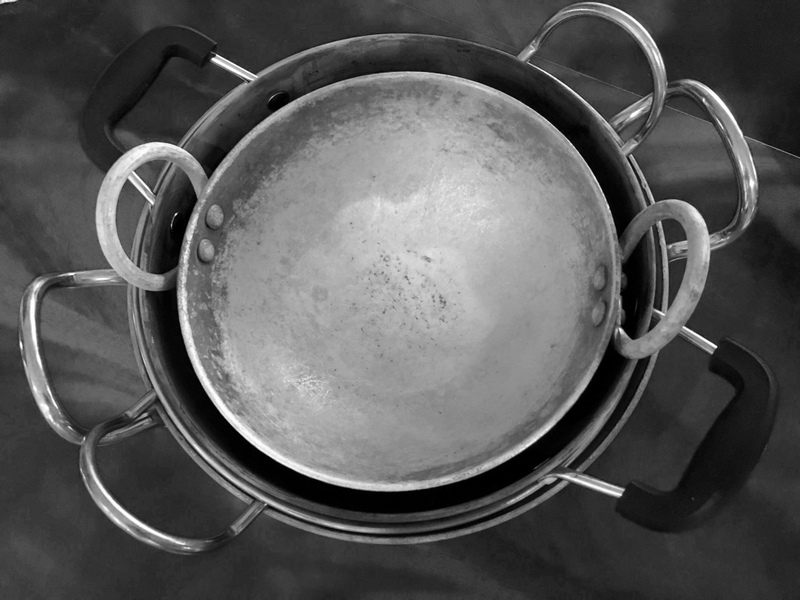 I use this to hold on to pots without handles such as my kadai or pots whose handles get too hot to hold as you’re cooking. Another staple found in most Indian grocery stores.